1. How do you as a designer want to skillfully and creatively meet the realities of the Anthropocene? (What kind of projects and actions do you think might be needed)? Designers have important roles in almost all processes of production in these days. As a result, designers should feel responsible in solving the problems regarding the Anthropocene epoch. The term Anthropocene implies how humans have enormous and irreversible influences on the history of the earth. With that said, designers should focus on decreasing the human effects on the environment and ecosystem even from the initial planning stage. For example, some creative research and application need to be done to dramatically reduce the use of plastics, which would otherwise stay on the stratum of the earth for a very long time. Also, designers should come up with eco-friendly resources that can replace the fossil fuels and chemicals. Furthermore, designers should work hard to raise their voices to the government and companies to provide definite suggestions and public campaigns. Unlike the common concept of designing, where the designers create new items based on the preferences of the customers and market, the non-designing design practices use old yet functioning products to come up with something. People tend to throw away the old designs when the new model is released, and through non-designing, the replaced products can still serve a different purpose and not be wasted. 2) How do your opinions of “good” design compare with Nagaoka’s? Would you define good design differently, how so? Nagaoka concerns more about how durable the products are and the quality of materials used. Although I do believe that those are necessary factors of a good design, I think I tend to prioritize how effective the design is to serve the intended purpose. Designs should be constantly modified and improved to fulfill their initial goals. Although the recent disasters in Japan are referred to as the primary causes for this phenomenon, I think the idea is applicable in other countries throughout the world as well. Compared to the past, people in recent years can easily obtain items they need daily without having to pay too much money. However, mass produced items are all similar to each other, and the companies use cheap materials to increase the profits. While standardizing and making lots of products were the main concerns in the previous era, people now want things that are specific to the individuals and meaningful to the moments of their lives. 4) What kind of design do you think appeals to young people today? I think young people in these days like novel and unique designs that are not commonly seen before. New technology often seems to appeal to them, which enables more advanced and developed concepts to be applied in everyday life. However, since the new generation is unfamiliar with the ideas and designs from the past, those could also grab attention from a group of people. Yes, if people do not care about the producers and users of the products, it would be very easy for them to become selfish. The producers would just focus on increasing their profits regardless of the quality of their items, and the users would only consider their current situation as they make purchases. Under that condition, many things would be produced, replaced, and wasted unnecessarily, which would eventually destroy everyone. One student made her project entirely out of natural materials she grew herself, which was very impressive. It must have been challenging to grow and make the clothing. However, it made me wonder if a common customer who is seeking for a new dress would be able to recognize her time and effort invested in the product. It would be nice if I could become a long-life designer. Nevertheless, as a student, I tend to use the resources that are currently available to me. Due to the money and time constraints, I cannot really do much research on materials and functions. However, in the future, when I have more access and freedom in the work I make, I will definitely consider the values of the long-life designing. 8) How might the concept of Long Life design be useful to designers working within the constraints of the Anthropocene? It is crucial to decrease the amount of wastes in dealing with the problems of the Anthropocene. With that said, the concept of Long Life design could provide an effective way to save the resources. To make new products, it requires necessary materials from the earth. However, at the same time, the old items that will be replaced by the new ones would be considered obsolete and thrown away, even if they still work fine. Nevertheless, if those items could be recycled and used to fulfill other purposes, the materials that are still in good condition do not have to be wasted. 3. What is a beautiful object/design that you admire from your home country that has been in production for longer than fifty years? Write a brief description (around a paragraph) about this object’s history on your Learning Portfolio and explain what you think makes it so resilient (able to still be in production for over 50 years). Include an image on your LP and please bring the object with you to class next week (if possible) for presentations. I remember seeing colorful thimbles my mother used to have. 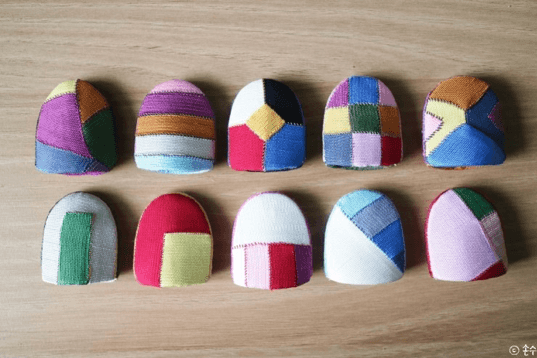 The thimbles are made out of a few pieces of cloth to protect the end of fingers during sewing, which are found in various forms throughout the world. In Korea, the origin of thimbles could be traced back to more than 1,000 years ago, and the materials used include metal, wood, and leather. However, all others but the current model with cloth disappeared over time; it became popular among people about 100 years ago and still produced in these days. 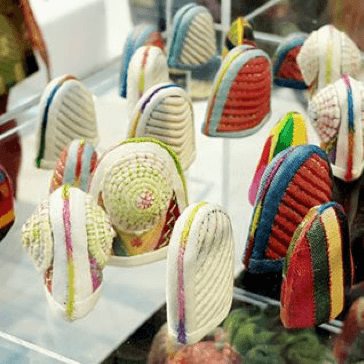 Sewing by hands is not too common anymore, but the detailed and miniature designs of the thimbles appeal to people to keep them as souvenirs or gifts. The thimbles are not used that much anymore in these days, but they are still manufactured actively. I think the reason to this is because of the simple yet refined designs of thimbles that reflect the culture of Korea. Also, they can be easily made from the useless pieces of cloth, and various designs are possible from the delicate needlework alone. Making thimbles does not require any chemicals or expensive materials, so more and more people seem to be interested in making them to have special tools for themselves. 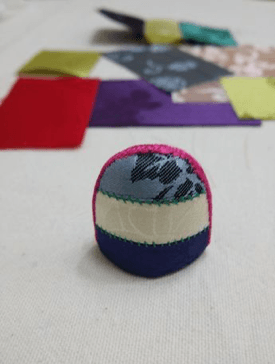 The thimbles transform pieces of fabric into an authentic household items, which is a typical example of the long-life designs. 4. Read the following article on kintsugi (Links to an external site.). Lacquer, the base of kintsugi, has been used for repair for nearly 1000 years in Japan. Are there similar practices of repair in your home country? What kinds of design and cultural values do you think enables a process of repair such as kintsugi to be practiced and refined over hundreds of years? In Korea, people have been using Hanji, a traditional handmade paper, to repair books. They starched the paper to exquisitely restore the damaged pages, which has artistic significance. Instead of just throwing away old items to buy new ones, repairing allows one to use things longer and have stronger tie to the objects. Further, if the process of repair not only restores but also adds a novel design or technique, it results in something that has more artistic values. In other words, restoring provides a unique characteristic to the object that cannot be found anywhere else. Considering how such methods can conserve resources and create a new artistic piece, it is clear why they are practiced and refined for a long period of time. 5. Read through the kombucha leather protocol carefully. What questions do you have? Then, start growing this natural material. Answer on your LP. How does it feel to try and grow your own material from tea and sugar? What do you think will be the biggest challenges for this project? The very first question I have is whether this leather actually turns out to be the same thing as the leather I know. The idea of growing natural leather with some tea bags and sugar is a little difficult to comprehend. Although it must be safe and clean, it still makes me slightly worry about growing some microbes. I think the biggest challenges for this project are preventing contamination and maintaining the right temperature. If something else gets into the container, everything has to be thrown away and repeated from the beginning. And if the temperature is not ideal, it may take much more time to obtain the leather.